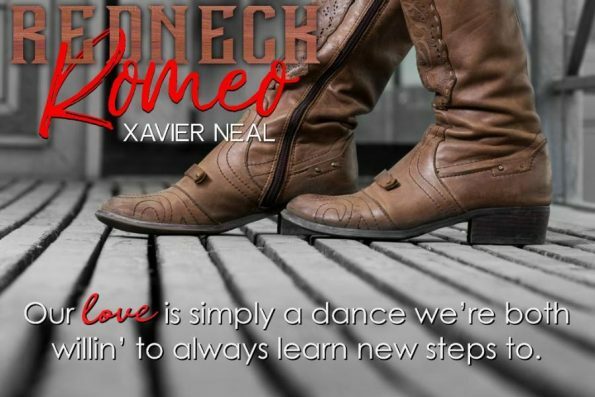 Review – Redneck Romeo by Xavier Neal – 5 Absorbing, Romantic Stars!!! After a whirl wind holiday romance, have Dustin and Carly got what it takes to travel the distance to fight to be together? Or will the outdated, egotistical, opinions of others tear them apart? Another fantastic romance from the talented Xavier Neal. She has written an all absorbing romance, that takes you hostage and takes you on one hell of an emotional roller coaster ride. My only disappointment, was when the story ended, I needed more, so much more. These characters had imbedded themselves in my heart, and I didn’t want to let them go. Redneck Romeo holds a strong, powerful message within its story. One that sadly is still a part of our society today. Xavier Neal has brought to the forefront that some of society still has some way to go, to working towards acceptance. Something that shouldn’t be a hard trait to have, and yet it still is. However, she also shows us how a lot of society has accepted the many wonderful diversities of life, and, that there are people who will always be there to support us and our life choices. This story, is also full of heart-warming, beautiful, and fun-loving moments. For Carly, and Dustin, it was instant love, they could feel their souls drawing them to each other. Together they were perfection, they had fun together, lived for the moment, supported each other’s careers, and although from diverse backgrounds, nothing stopped them from wanting to be with each other. I couldn’t get enough of their story, I honestly felt as though, I was living their story with them. If you enjoy romances, that touch on serious life dilemmas, with added humour to give the story that fun feel, give Redneck Romeo a try, you won’t regret it!